No one wants to be known as the king or queen of boring conversations. One way to prevent tedium is to avoid predictable speech patterns. 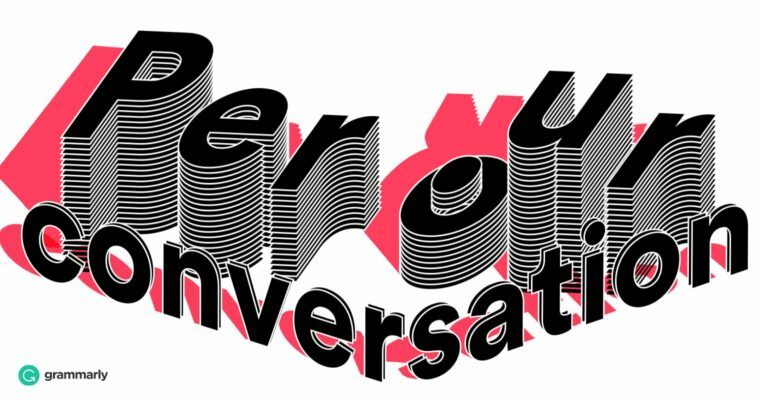 Are you guilty of overusing “per our conversation?” Grab your listener’s attention with five fresh variations! As I mentioned, the meeting on Sunday will cover the five principles of effective communication. As the contractors mentioned, the tile in the bathroom is in dire need of repair. Of course, you can use “as mentioned” without pointing out the speaker if keeping track of conversants isn’t your goal. As mentioned at the board meeting, Gary Schlepper will be responsible for providing the snacks for our annual company picnic. 2 As Agreed Often, the motive behind a “per our conversation” email is to remind others of something they said they would do. The best phrase for the job is “as agreed.” If you made a contract, this expression is especially useful for reminding different parties of their obligations. As agreed, your company is expected to deliver the tables and chairs to the venue before 8 am. As agreed, the contract revision period will end on July 5, 2018. We will not consider requests after this date. Thank you again for the interview on Wednesday. I am very excited about this position and your company. Following our conversation , I realized there were two more things I wanted to tell you that time didn’t permit us to cover. Following our conversation , the superintendent recommended to the Board of Education that I be appointed principal of that school and the Board approved his recommendation. Pursuant to our conversation, I have enclosed for your review a rough sketch of the dress design. If the design meets your approval, please return the sketch and down payment for your garment in the envelope provided. Note: According to the , these two phrases are too formal for non-legal correspondence. In a section on clichés, K. Dennis Chambers challenges “pursuant to our conversation”: “Would you ever say that in real life? Would you sit down with a colleague over coffee and say, ‘Hey, Joshua, pursuant to our last conversation. . .?’” Most people wouldn’t. If you are an exception, you might want to risk trying these two controversial options for the sake of variety. Summarizing a conversation is an essential practice if you want to create a record for reference or to make sure that both parties understand each other. In this case, the simple “according to” is the most appropriate phrase to recap a conversation. (1) The new webpage will go live. (2) Employee discounts will increase from 10% to 15% of the sales price. (3) We will implement casual Friday. According to our conversation, articles will be due at midnight until further notice. Here’s another reason to avoid using “per our conversation.” classifies the word “per” as jargon when it’s used to mean “according to.” What do you say? Will you freshen up your vocabulary with one of these five fresh phrases today?